23.03.2018 – Duisburg. 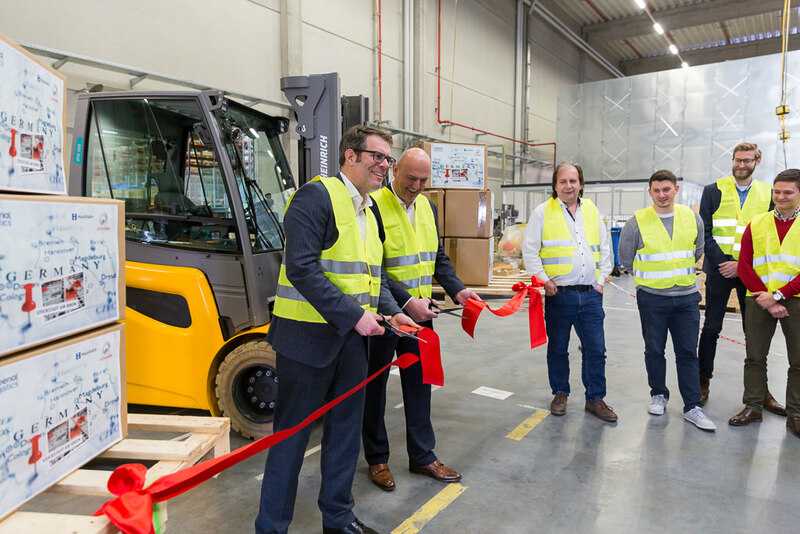 The lift and escalator manufacturer, Schindler, has reorganised its spare parts logistics operations and relocated them from Berlin to the multi-user warehouse operated by Imperial Logistics in Stockstadt am Rhein, Germany. Jörg Naescher (left/CFO of Schindler Deutschland AG & Co. KG) and Adrian Kaczmarczyk (second from the left/COO of Imperial Logistics International) during the joint start at the multi-user warehouse operated by Imperial Logistics in Stockstadt am Rhein. Imperial Logistics has been supporting well-known clients from the engineering, plant construction and building equipment sectors there since 2012. Supplying dealers with spare parts and kits will be managed from the multi-user warehouse measuring 13,000 square metres and located just south of Frankfurt/Main in future. It is envisaged that more than 2,000 items will be delivered every working day. In addition to the standard processes –such as picking, packaging, shipping and processing returns –supplementary services will be undertaken. These include assembling sets of parts (kit building), replenishing supplies for fitters or supplying building sites. In addition to the Stockstadt facility, Imperial Logistics has been operating another multi-user warehouse for spare parts logistics in Herten for many years. Both multi-user warehouses guarantee steady utilisation of the warehouse space and personnel, with clients benefitting from resulting cost saving and improved efficiency synergies. The Schindler Group, which was founded in Lucerne (Switzerland) in 1874, is one of the world’s leading providers of lifts, escalators, moving walkways and associated services. Schindler moves 1 billion people all over the world every day with its mobility solutions. More than 60,000 employees in over 100 different countries support this success story. Schindler Deutschland was established as the first foreign subsidiary in 1906. More than 4,000 employees at over 70 business sites work to guarantee the company’s success in Germany.